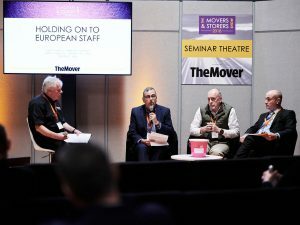 We held a session at the recent Movers & Storers Show titled ‘Holding on to European Staff’. This was a panel debate with Mario Amato (Head of Group Business Development at White & Co Plc), Ian Studd (Director General of the BAR) and James Backhouse (Director and Solicitor with Backhouse Jones). We posed the question ‘are we sleep-walking into an industry crisis’? During the debate we discovered that many UK removal companies employ European staff and therefore they could be in a precarious position should the UK depart Europe without an exit agreement in place. Mario made it very clear that Home Office has addressed the process and its communication to businesses, to allow qualified EU citizens to achieve permanent settlement in this country. This is all covered with a tool kit available to companies (see link below). He said ‘At White & Co, we placed posters describing the Home Office initiative in each of our branches driver’s rooms and it’s a subject quite dear to us, as we employ quite a few eastern European nationals. The key for us is to put a stop to the continuing haemorrhage of EU nationals who have already opted to return home, and to reassure the ones who wish to remain that they are an integral and valuable part of our organization’. The Government is concerned about this issue and formulated an advisory committee which Mario was invited to join. 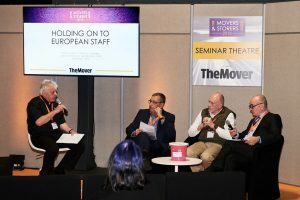 During a question from the audience it became evident that the problem was already starting to bite when it was revealed that container delivery now needs a 10 to 12 day lead-in time against a previous lead of just 2 days – reason being that many of the European HGV drivers employed by container companies have already started to head home. After the debate several of the European nationals in the audience discussed the issue further and it became clear that one of the key issues for them was being made to feel unwelcome in the UK. Add to that the uncertainty of Brexit and you may see the importance of subject and the need to act now to stop more departing our shores. Regardless of your personal views on Brexit, the fact is the UK has skills shortages throughout many sectors. According to the FTA in a report called Skills Report Shows UK Reliance on EU Workers to Keep Britain Trading: ‘As with other service industries, logistics is currently facing significant skills shortages, and the loss of workers from the EU will put further pressure on careers including HGV and van drivers, fork lift operators and warehouse personnel, with EU workers representing more than 12% of the UK’s logistics workforce’. One thing is for sure, you need to act quickly and make sure you minimise the impact on your business over the coming months.